There’s something so fresh and bright about a slice of cheesecake.Today we are sharing just a few of our favourite cheesecake recipes to help you get inspired to bake something new with these mouth-watering recipes. Just click on the links below to snag your new favourite recipe below. There is something here for everyone! Where did we find all these yummy cheesecake recipes? Does your family enjoy a slice of cheesecake? I’d love to see your favourite cheesecake recipes as well and add them to my list! Happy baking! Gosh! This is an amazing list. I love, love, love cheesecake but I’ve never tried making one so thank you so much for the recipe. This post is sinfully delicious! I am down for that lemon white chocolate! Who am I kidding? I am down for all of them! Thanks for this. This post is Winning so I am Pinning! Oh thank you for mentioning my cheesecake! Greetings from Such Yummy Stuff. So glad that you liked it 😉 You’re always welcome for more inspo! Wow! What an amazing compilation of cheesecake recipes. Won’t have time to go through all of them but will bookmark and share this page for future reference. Thanks. Okay, well you totally had me at Cheesecake! Geez…there are so many varieties! I can’t pick my favorite. I got a new Push Pan from Love Cooking and it is the perfect pan for cheesecake. I’m definitely going to pull that sucker out and get busy baking from your decadent cheesecake list! Yum! What an incredible list! We LOVE cheesecake around here and I can not wait to get back into a house and out of this extended stay hotel (relocation) so I can have an oven again! No bake just isn’t the same as the real deal, but I would totally take either right now! What a list! Wow! My family loves cheesecake, especially my husband. I actually tried to make my very first cheesecake just last month. It was a no-bake turtle cheesecake and it was amazing. I can’t wait to try to make another one. Now I just have to pick which of the 42 to try first 🙂 Thanks again! That would be the first one I would try! It sounds ah-mazing. Wow! These looks so awesome. I am so going to have these out. I am bit on the Chocolate Cheese Cake and I like how creamy it looks. Wow, this is quite the ultimate list for cheesecake lovers. I wonder if someone would actually try every single one of these recipes–it would for sure be delish but then I would think you would have to live in the gym. Thanks for sharing these great cheesecake recipes. Oh cheesecake, how I love thee! I’ve stopped having birthday cake for my birthday and go for cheesecake instead. I can’t wait to try out some of these fabulous recipes! They look amazing! Thank you Heather, for mentioning my recipe for my mini cheesecakes. Cheesecake is probably my favorite dessert to get out – I have never made one though. I make mini cheesecakes, and that is about the death of me – they look so small, of course I can eat one more! You had me at cheesecake. 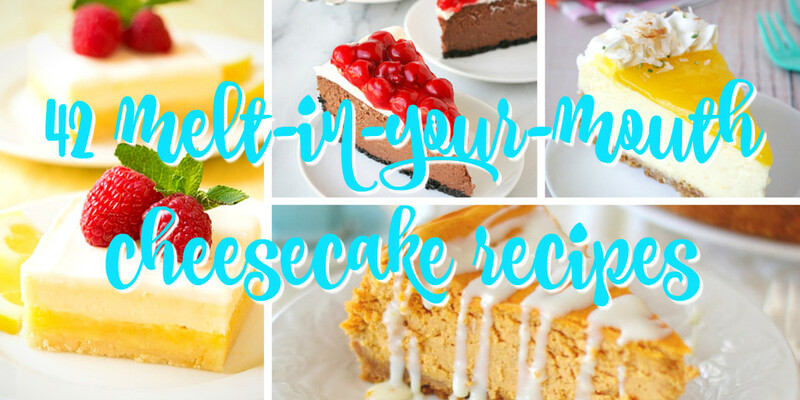 I had no idea that there were so many delicious ways to create and enjoy cheesecake desserts. It’s such a fun way to enjoy one of my favorite treats. YESSS! Cheesecake has sounded so, so good lately! Thin mint cheesecake bars are right up my alley. I have never made a cheesecake! Now I can’t decide which to try first! this may be the death of my diet?!? Wow , a great list. I can hardly wait to try the Candy Corn Cheesecake… aw heck, I want to try them all! Oh my goodness, this does not look good for my waistline! These all seriously looks delicious! Wow, where in the world do I start? Who knew there were so many different ways to do cheescake! Oh wow! This will be my go to list for ANYTHING cheesecake! Thanks for all of these! Cheesecake is def. a fave of min. I think Amaretto Chocolate Cheesecake is the best I’ve tasted. I am all about cheesecake! It is one of my very favorite desserts! I am going to have to try some of these. The recipes look and sound sooo good! I can’t wait to try them! Hubby is a big cheesecake fan! I can’t remember the last time I had a piece of cheesecake. With so many new recipes to try, I’m more inspired to whip one up. Well my computer monitor just melted – yum city. I love a good cheesecake recipe. You just don’t even know how much I love cheesecake. I would eat every single one of those. I normally hate banking, but love cooking! I do love making cheesecake though. Maybe because it is just so delicious! How do you choose where to start? I want them all and I would win my husband’s heart a thousand times over! WOW! This is like the 5th dessert recipe that I came across today! Making me crave some sugary treats for reals! That Lemon White Chocolate Cheesecake sounds amazing! Thank you for sharing these great resource list! I’m always looking for new desserts to try and take to different functions. YASSSSSSSS! Cheesecake is my weakness in life. I am going to make it my mission to make ALL of these recipes! Thank you, Heather, for including my cheese flan! This roundup look phenomenal – I’m a cream cheese addict! Pinning and sharing all around!